Register for free now to join the fastest growing lotto community on the internet, where you get the chance to win the biggest jackpots across the world from EuroMillions to PowerBall! Do you need any advice or assistance playing at Lottoland e.g. the time of the next draws; what the prizes are; how to claim your winnings and more... Most of your queries can be resolved quickly and easily in the Frequently Asked Questions section located in the Help tab or under each lotto game section. If you can’t get your answer from our FAQs, then simply click on the green contact button on the right of your screen to send us your query. We can’t predict the numbers but we know everything else! EuroJackpot: Europe’s newest lotto - a better chance to win! The EuroJackpot is similar to the EuroMillions game but the main jackpot prize is easier to win plus cheaper to play! Match 5 numbers plus the 2 lucky stars and you could win up to 90 million Euros. To play you pick 5 numbers between 1 and 50, and another 2 additional numbers (lucky stars) from 1 to 10. Each line costs 2 Euro, with a handling fee of 50 Cents per ticket. 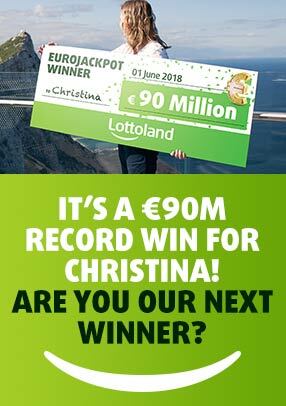 Exclusive Lottoland features NumberShield costs an additional 1 Euro and Double Jackpot from 2 Euro extra. Join the hunt for Europe's biggest jackpots: the DoubleJackpot feature raises the maximum EuroMillions payouts from 190 Million Euros to an incredible 380 Million Euros! Play now by picking 5 main numbers from 1 to 50 and 2 stars from 1 to 11. Each line costs 2.50 Euros and the Double Jackpot feature is just from extra 2 Euros.